Truett Allen was a highly driven and successful bank executive until a series of traumas to his heart and brain nearly killed him. A decade later, after three brain operations and several months in critical condition, he appears superficially to be restored. He is articulate and still displays exceptional intelligence, yet he is not himself. He sits idly each day, with little or no drive to work or take care of himself. His wife says, "This isn't the person I married." Truett suffers from the perplexing brain condition known as frontal lobe syndrome: the damage to his brain has transformed his personality. Dr. Elkhonon Goldberg, a world-renowned neuroscientist who works with Truett, has studied the human brain for four decades. He is the author of The Executive Brain, the first popular book about the frontal lobes, in which he contends that the frontal lobes are the most "human" regions of the brain, the area that most closely defines our character, our drives and our ambitions. A Change of Character chronicles Dr. Goldberg's efforts to restore those aspects of Truett's mental capacities and personality lost after he experienced frontal lobe damage. 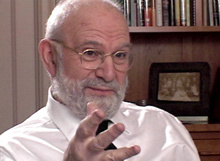 The video also features neurologist and best-selling author Dr. Oliver Sacks (Awakenings, The Man Who Mistook His Wife for a Hat) who has consulted on Truett's case. 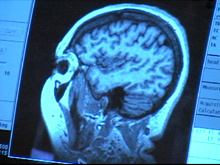 The documentary producer was granted access to a wide range of remarkable visual materials, including home videos and family photos that reveal Truett's personality prior to his traumas, detailed CAT-scans showing Truett's brain damage, and state-of-the-art digital brain imagery. 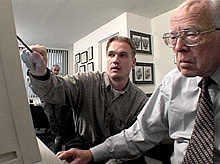 The video features intimate scenes of Truett as he functions today and a dramatic scene of his innovative rehabilitation program, which may foreshadow an important future trend in mental health care. In this revealing portrait, A Change of Character provides an in-depth look at the impact of frontal lobe injury, and offers viewers a captivating and intriguing look into the mysteries of brain, mind and personality.